As a Web Hosting Reseller! Perhaps you want to make some extra cash to pay off your bills, or take the vacation you’ve always wanted. Maybe you already run a successful business, and you’re looking for ways to make more money with less effort. Perhaps you're a web designer looking for a way to provide hosting to your clients while increasing your profits. I started my first web hosting business with a $40 investment, and turned it into a six-figure income within the first year! If you have the desire to run your own web hosting business, my e-course can save you time and money while providing valuable inside information that will make the difference between having a successful business or just another failed attempt. If you’re reading this, you’re probably interested in gaining more money, more freedom, living a more fulfilling life, or all of the above. Do any of these things strike a chord with you? Did you know that the internet is a money-making machine that works 24 hours a day, 7 days a week? At all times, regardless of what you’re doing, money is being made by someone on the internet. That means that while you're eating, sleeping, working and playing, money is pouring into the pockets of internet entrepreneurs from all around the world. The internet is so big, and there’s so much money to be made that there’s plenty of room for anyone to join the system and start profiting from the power of the internet. Imagine owning your own internet business, and each time a customer makes a purchase the money is automatically sent to your account, even if you’re sound asleep! Trillions, yes trillions, of dollars are being spent on the internet and thousands of people are discovering a new lifestyle and fulfilling their dreams each day. Would you like to be one of them? If they can make money on the internet then why can't I? After six years of searching the web for a real way to make money, I finally found my answer--actually I rather bumped into it by mistake! Before I tell you how I bumped into it, and exactly what it was, just let me tell you that there are two main things that made this opportunity different from the rest. 1) It was a REAL business opportunity to run my OWN business. The opportunity that I discovered is certainly not the only way to make money on the internet, but it was one of the first ones I came across that met those two criteria. The problem is that most "Business Opportunities" on the internet do not even meet the first requirement on my list. They are not a REAL business of your OWN. Many of them are scams, and others are simply ploys to help build someone else's business. Beyond that, there are only a handful of opportunities that meet my second requirement which is; it must work! Do you want to know how I accidentally bumped into this great business? Throughout my "internet quest" I tried numerous so-called business opportunities. Perhaps like you, I wasted a lot of time and money trying things that didn't work. One of these so-called business opportunities required me to have my own website from which to sell products. The great part about that experience is even though I wasted time and money I also learned from the experience. For example, I learned how to build a website using basic HTML and upload it to the server using FTP. So don't feel bad if you've wasted time and money looking for the right business! If you learned something, then you're better because of it. Just don't keep making the same mistakes! That's why I'm here: to steer you in the right direction. Unless you want a terribly unreliable website with someone else's banner ads popping up all over it, you need to pay to have it hosted. At the time I was paying $12.95 per month to have my site hosted, which is actually a good price for reliable hosting, but as a struggling entrepreneur I wanted to find out if I could save money and get it done cheaper. So one day I sat down and searched the internet far and wide for the cheapest web hosting I could find. The ad said I could host my site for only $2 a month but that I would have to pay a small fee to find out where! Of course I immediately thought it was a scam, but it was tempting nevertheless, because it sounded like such a good deal. Did I pay for the info? I have to admit it. My curiosity got the best of me and I paid to find out the "secret source". Sure enough, the confirmation page directed me to a small unknown web host who was selling hosting for $2/month. Just below this spectacular $2 offer was another offer that said I could host my website for only 40 cents per month! Well now I was almost sure it was a scam, but then I noticed there was a catch. In order to get that rate, I had to sign up for the 100-website plan for $40/month. Still, if the offer was legitimate, it was a phenomenal deal. The offer went on to explain that I didn't have to actually have 100 websites to take advantage of the great deal. It said I could resell those spaces to other people! Now they had REALLY caught my attention. I'd say my interest level was at an all-time high. I left that browser window open and quickly hopped onto a search engine in another window to do some research. Within a few minutes a discovered that almost all web hosting is resold at some level. Even if a web host calls themselves a top level host, or an ISP, chances are they are reselling those hosting resources from someone higher up. It's interesting that I never saw any such information when I was shopping for a web host, but when I decided to research the nitty-gritty backend of the web hosting industry I easily discovered that most hosts are essentially acting as resellers! Well to make a long story short, I decided to take a stab at it. The articles I found on the search engines revealed that untold millions were being made by web hosts, and I wanted my piece of the pie. After all what did I have to lose? In terms of business opportunities, the startup cost was tiny (only $40 in my case). Besides that, I needed a host for my own website, and I was wanting to build a couple other websites as well. I figured if I could just resell a few of those 100 hosting spots then I could break even on the $40/month and at least be hosting my own sites for free! Needless to say, I did resell those hosting spots. In fact I found that there was such a demand for hosting that I quickly sold out all of those 100 spots and shortly thereafter leased my first server. I turned the business into a full-time income within months and was making over $100,000/year within the first year. I was able to quit my day job and work from the comfort of my own home office where I get to eat lunch with my beautiful wife and play with my kids anytime I want to. It was a goal and dream ever since the beginning of my long and enduring Internet Quest, and seeing that dream become a reality was a great milestone in my life. I believe the same type of success can be experienced by you if you have the desire and discipline to make it happen, along with the essential information and knowledge to get you started. Again, that's where I come in. 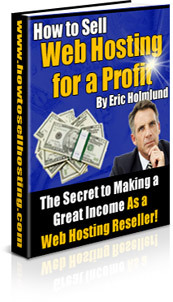 I wrote this e-course to help you start your own web hosting business with success. If you think this type of business might be right for you, do yourself a favor and read my e-course so you can get started on the right foot. 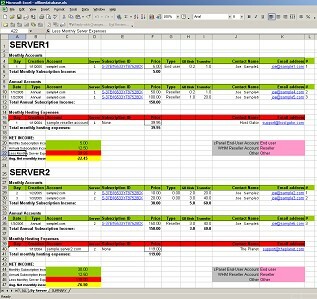 I am studying your ebook on Web hosting. It is something I have always been interested in, but like you say, it is a business that is hard to get going if you do not know the ropes. Thanks for offering this great product. And, thanks for taking the time to write it. I have never seen anything giving a step-by-step guide to this awesome enterprise. Your ebook will be very well appreciated. Every day there are thousands of websites added to the world wide web. Today there are millions upon millions of websites, and millions more are added each year. And guess what? EVERY single one of those websites has to have a host! If they didn't have a host, nobody would be able to see their website. There are literally so many websites being added to the web each day that if you could even capture a small fraction of a percent you could be rich! Think about it. Web hosting is one of the most powerful business opportunities you can leverage without spending a fortune. Web hosting is the possibly the fastest growing internet sector in the world. "Web hosting revenues will reach $19.8 billion by 2004, up from $1.4 billion in 1999" - International Data Corp.
And according to Frank Feather the author of FutureConsumer and G-Forces, "By 2010, the Internet will gobble up 31% of consumer spending, leaving most brick-and-mortar retailers in rubble." In other words, if you don’t want to get left behind in the dot com world, it’s time to join the online revolution by starting your own web hosting business today! My e-course contains valuable information that can be applied to your current reseller situation, or any web hosting reseller opportunity that you are currently considering. If you don't know anything about reseller opportunities or even about web hosting, that's great too! I'll tell you where you can sign up for a plan that will meet your needs. And no--I'm NOT just trying to sell you hosting! This is not one of those business opportunities where you have to purchase the author's service in order to make it work. My information will work anywhere! What's Included in the E-course? This e-course covers the basics, starting with fundamental definitions you need to know; and progresses to advanced techniques that even the most experienced resellers will benefit from. It contains 114 pages of money-making information that will change the way you look at the web hosting industry! You will discover the steps necessary to become a successful web hosting reseller. While there are many ways to build and operate any business, we will look at an approach that has been proven successful by many resellers including myself. Step 1 - Learn the basics: Before we jump into the nitty-gritty details, we'll make sure you are familiar with the basics of hosting and what this opportunity is all about. Step 2 - Learn about various reseller opportunities: How do you choose? We'll cover affiliate programs, private-label resellers, VPS, dedicated hosting and more! Step 3 - Get started with a business plan: A business plan is beneficial to your success, and I'll tell you what you need to include in yours. Step 4 - Sign up for a service: Once you've got your plan put together, it's time to sign up to be a reseller. I'll tell you what to look for, and what to avoid! Step 5 - Build your own website: Your website is one of the most important parts of your business. I'll tell you what you NEED to include if you want to be successful. Step 6 - Set up your backend and hosting plans: This is one of the most important aspects of your business, yet overlooked by many resellers. I'll tell you how to set up your business backend to run smoothly so you can focus on building your business. Step 7 - Market your services: Marketing is the lifeblood of modern entrepreneurs. If you don't know how to market your product, you'll be dead in the water. I'll tell you the best ways to market your hosting services. Step 8 - Support your customers: This is possibly the most critical aspect of your long term success. Hosting clients are looking for good support. I'll show you how to support your customers and keep them happy even if you have no technical experience! Step 9 - Get advanced techniques and advice: Get some awesome tricks of the trade that I've learned along the way. Increase your productivity and boost your profits! Step 10 - Sell your business: Most new resellers don't realize that one of the best ways to make money in the hosting business is to sell your hosting customers and/or entire business. I'll tell you what to do to make sure you're setting yourself up for a profitable sale. 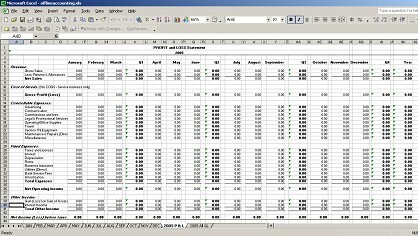 You will also receive some valuable Excel spreadsheets that I created and used to successfully run my web hosting business. You'll discover the secret formula I utilized to track my results and make adjustments accordingly to maximize my profitability and growth. You will also receive instructions for my accounting process, including the actual spreadsheets I used for my monthly books, and a technique that saved me a ton of time when I was ready to do my taxes for the IRS. 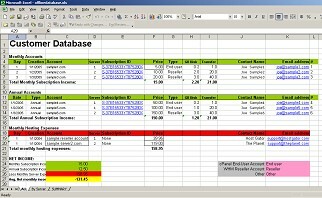 The spreadsheets you will receive are actual Excel spreadsheets that you can download and use for your business! I've sold hundreds of copies of this e-course, and believe me, people are willing to pay for it! I charge $300.00/hour for consulting, so just imagine what my entire arsenal of knowledge could be worth in the hands of a web hosting reseller. This kind of information doesn't usually come cheap, and rarely will you find high quality material for free. We'll definately be staying in touch with you and if there is anything that we can ever do to support you, please don't hesitate to ask. That's right, you can download the entire thing right now as my gift to you. I realize you were probably already reaching for your credit card. People were buying my e-course all day long when I was charging money for it. Lucky for you, I've decided to make my e-course available for free, for a limited time! Considering that this information can save you from having to endure weeks and months of a painful learning curve, it's easily worth hundreds of dollars to anyone who wants to start a web hosting business. Please download it immediately before I change my mind and decide to start selling it again! Thank you for taking the time to learn about this opportunity. If you have even the slightest desire to make money selling web hosting, I encourage you to download my e-course. You have nothing to lose, and the opportunity of a lifetime to gain. Again, I want to emphasize that this is a REAL opportunity, not like the get-rich-quick schemes that you've bought only to be disappointed. This is the chance to work from home, take control of your own destiny, and start making REAL money. I wish you the very best in your web hosting endeavors, and anything else you set your mind to! P.S. - As the old saying goes, people don't plan to fail; they fail to plan! Please don't try starting a web hosting business without a proper plan. It will only end up costing you time, money, and frustration--not to mention disappointing any clients you are able to obtain before your business fails. Invest a small amount of time to read my e-course and learn from it. By the time you finish it, you will know whether the web hosting business is something you want get into, and you will be equipped with the information to start your business on the right foot! What are people saying about my e-course? "Eric, I'm enjoying the read and wheels are starting to turn. Thanks!" "Thank you very much. It is an excellent ebook." "You have definitely put in a lot of work into this book... Great book!" "Excellent! Well written and concisely executed book; great information." "Excellent eBook. Professional view on hosting market today. Thank you :)"
"Excellent ebook for any web hosting reseller! Easy to read." "Very informative, with useful ideas. Great buy and I will make good use of it shortly." "Valuable 'down to earth' information! Thank YOU." 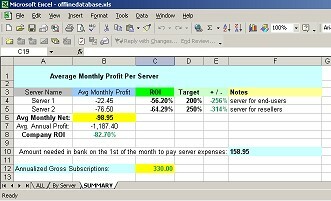 "Nice Hosting Business Guideline. I can do it and make profit easy. Thank you!" "Great E-book, thanks for the info. Worth the money!!" "Great Info! I can't wait to start applying it to my web hosting business! Thanks a ton!" "Fantastic Ebook..very informative...A + Two Thumbs UP!!!!" Copyright © by Eric Holmlund LLC, All Rights Reserved.